Record numbers of children are expected to be fed by food banks this Christmas, the UK's largest food charity has warned. The Trussell Trust told BBC Radio 4's You and Yours the next UK City of Culture, Coventry, is now also home to the UK's busiest food banks. It also said changes to Universal Credit "do not go far enough". The Department for Work and Pensions said new advance payments would help the transition to Universal Credit. An analysis by You and Yours of Trussell Trust data covering half a decade shows demand from children at Christmas has tripled and looks set to rise further. The charity has a network of more than 430 food banks, part of an estimated 2,000-plus across the UK. Typically in December, a higher-than-average 40% of food parcels go to children as demand from single parents and families rises, and school holidays cut off access to free meals. Last December about 30,900 children were estimated to have been fed by the trust's food banks, up from approximately 9,600 in 2012. The figures are calculated by halving the number of food parcels handed out to children, as an average child receives two parcels during a "crisis" period. A parcel is enough food for about 10 meals and can include baby products such as bubble bath and nappies. More than 61,800 food parcels were given to children by Trussell Trust volunteers last December, up 7.5% on the same month the previous year. 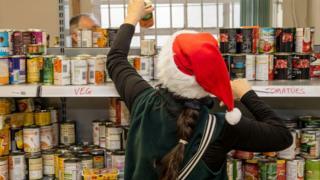 "Every year we see a spike in demand at Christmas but this year food banks are expecting their busiest Christmas ever," said Mark Ward, interim chief executive at the Trussell Trust. "The stories we hear are as inspiring as they are heart-breaking. "One mum told us that she was relieved, as her daughter's first Christmas was taken care of with help from the food bank," he said. The trust revealed that Coventry, 2021 UK City of Culture, has a less coveted title - the city with the busiest food banks. Coventry's 17 Trussell Trust food banks are the most heavily used in the UK network, the charity told You and Yours. More than 18,000 people have visited Coventry's food banks so far this year. Between April and September there was a 25% increase on the same period in 2016. But as well as having big problems, the trust sees the city as part of a solution. Coventry is also now home to the charity's Midlands Regional Distribution Hub, a 25,000 sq ft warehouse described by the charity as the "largest food bank in the UK". The trust plans to use the extra space to house increased corporate donations, using the extra stock to ease shortages regionally and in some cases nationally. In June the warehouse was used to house excess donations to the Grenfell Tower victims, later returning the stock when it was needed. The Department for Work and Pensions told You and Yours: "Reasons for food bank use are complex so it would be wrong to link a rise to any one cause." Certainly Trussell Trust data shows that reasons for hunger are numerous, with low income, debt, and sickness all common causes. However, the biggest single cause, according to the charity's figures, is "benefit delays and changes", which was given as the main reason in 43% of referrals. Between April and September, the trust says, there was a 30% increase in demand for food banks in areas where full Universal Credit had been in place for six months or more, compared with the same period in 2016. Despite faster advance payments now available to people claiming the benefit, the charity is warning that the changes will not be enough for some. "With long waits for payments and some poor administration, we're concerned that even more people will be needing food over Christmas," said Mark Ward from the Trussell Trust. "Though we welcomed changes to Universal Credit announced in the Budget, many improvements will not come into force until 2018, and do not go far enough to fix all of the problems with the new system." The Department for Work and Pensions rejected the criticism. "Anyone applying for Universal Credit has access to advance payments within five working days, and on the same day in urgent need," said a spokesperson. "Work is the best means of providing people with financial security, and with our welfare reforms people are moving into employment faster and staying there longer." You and Yours is on BBC Radio 4 weekdays 12:15-13:00. Listen online or download the programme podcast.